Hans J. Wegner is the father of Danish design and is well known for creating some of the most iconic chairs of the past 100 years. 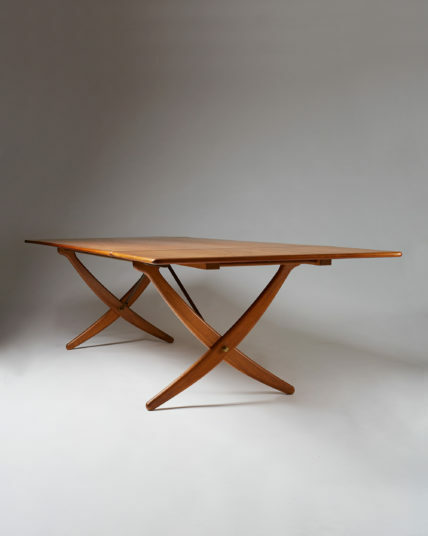 The son of a cobbler, Wegner brought Danish design to the international stage through his deep understanding and enjoyment of wood as well as an eye for beautiful and ergonomic design that had hitherto existed. 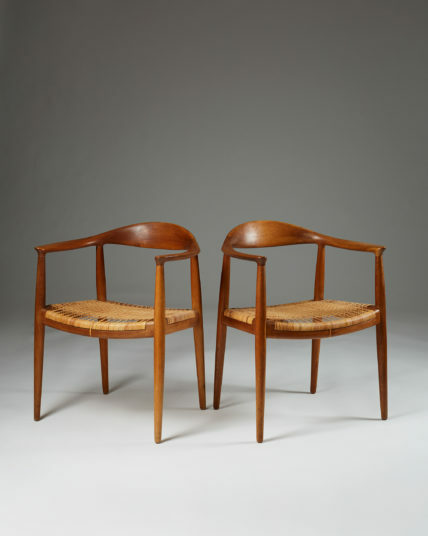 Wegner is seen as the most influential designer within the Danish movement and his early innate ability with wood matured into the gift of an unprecedented amount of over 500 beautiful and functional gifts to the pantheon of design. 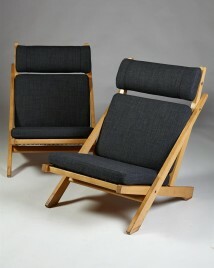 Hans J Wegner brought Danish furniture to a world stage through his simple, elegant and ergonomic chairs. His CH24 models still litter the offices of design and architectural practices globally and his earliest pieces have become rare design milestones in museums and galleries. 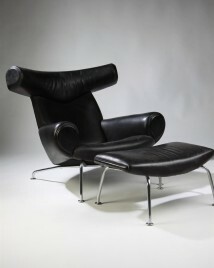 Hans J Wegner is certainly one of the most important designers of the 20th Century. 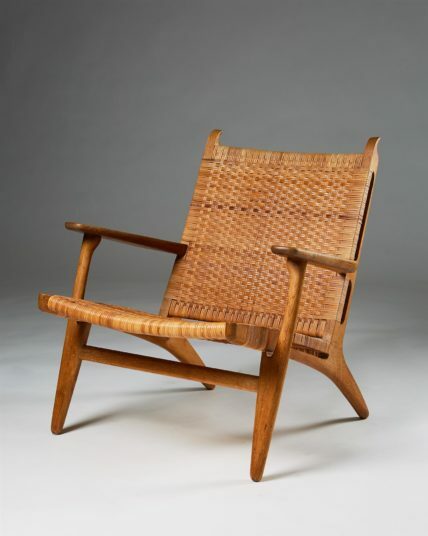 Wegner’s first renowned chair came though his work with the Chairmen of the Danish Cabinetmaker’s Guild; Johannes Hansen. 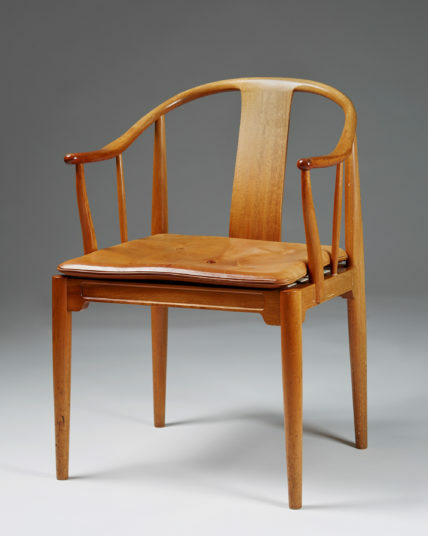 Through their intellectual relationship Wegner was able to design a chair he christened “the round one” in 1949 and would go on to be called the defining name; “the chair”. This elegant, restrained, yet organic chair was a pivotal design for Wegner and signalled the beginning of his own unique reign over seat furniture worldwide. This chair also illustrated the point at which the wider world took proper notice of Scandinavian design with it triggering the first American editorial spotlight on Danish Design. 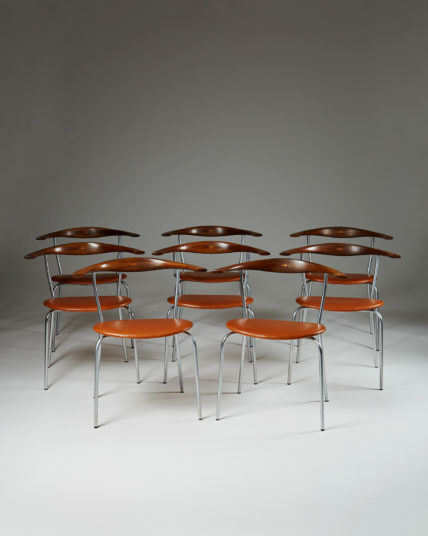 The influence and fame of this design can again be recognised in the fact that it was chosen as the seating for the 1960 American Presidential Election debates and shipped from Denmark especially for the occasion. Thus giving the “no.501” its occasional name: “the Kennedy Chair”. The pivotal nature of this chair along with its perfect form has made it one of the most desirable pieces of Danish design. 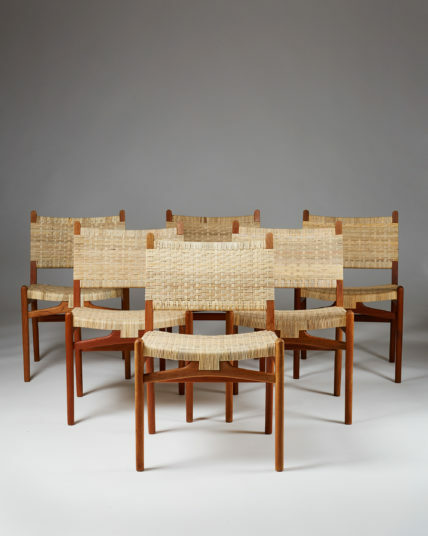 In 1943 Wegner began to design the first iterations of his Chinese chairs, taking inspiration from paintings of Dutch traders sitting in Ming dynasty chairs. This series of chairs developed throughout the years to become the CH24 (Wishbone Chair); his most iconic chair, released in 1950. This chair has become the zenith of Danish design and is still in production some 67 years later, making its older sibling; “the Chinese chair” incredibly desirable and collectable today with its elegant, formal but comfortable style. The Wishbone Chair was produced by Carl Hansen & Søn and was one of five chair designs that Wegner penned in his first three weeks with the company. Within these five designs are Carl Hansen & Søns most recognisable pieces and also some of the most iconic chairs of the past 100 years. How Wegner’s chairs have become quite so influential is explained by the Head of Exibitions at the Danish Design Museum; Christian Holmsted Olesen. He demonstrates that Wegner’s early chairs “possess all the properties that characterize Danish Design: they are based on a long history of craftsmanship and are all inspired by historical furniture types. They are made from natural materials and are therefore both sustainable and durable. They feature organic forms and have a human dimension - even with their strong artistic expression, they are clearly designed for everyday use." The principles contained within Wegner’s chairs would become the defining points of Danish Design, making early and original models of his chairs important historical design artefacts. Wegner’s furniture was intended, as he said to be “as simple and genuine as possible, to show what we could create with our hands, to try to make wood come alive, to give it spirit and vitality, and to get things to be so natural that they could only have been made by us.” Wegner’s success together with this design ethos ensured that his impact on design was recognised with an honorary membership of the Royal Danish Academy for the Fine Arts in 1995, and by being given an honorary doctorate at Royal College of Art in 1997. Danish design is seen as one of the most important creative movements of the 20th century and with Wenger recognised as its father he is indeed one of the most influential figures in modern design.